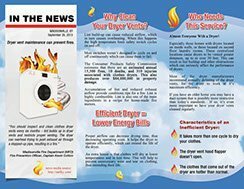 The Consumer Products Safety Commission estimates that there are an estimated annual 15,500 fires, 10 deaths, and 310 injuries associated with clothed dryers. This also produces over $84,000,000 in property damage. Accumulation of lint and reduced exhaust airflow provide conditions ripe for a fire. Lint is highly combustible. Lint is also one of the main ingredients in a recipe for homemade fire starters. Proper airflow can decrease drying time, thus decreasing operating costs. It helps the dryer to operate efficiently, which can extend the life of the appliance. An extra bonus is that closes dry at a lower temperature and in less time. This will help to prevent unnecessary wear and tear on closing, thus extend their life. Almost everyone with a dryer! Especially those homes with dryers located on inside walls or those located in second floor laundry rooms. These centralized locations cause dryers to be vented greater distances up to 50 feet. This can result in lint build-up and other obstructions which can seriously affect the performance of dryers. Most of the dryer manufacturers recommend annually cleaning of the dryer vents, for the dryer to work at maximum efficiency. If you have an older home you may have a duct system that is possibly more restrictive than today’s standards. If so, it’s even more important to have your dryer vents cleaned regularly. Our equipment includes one of the most powerful vacuums in the industry, combined with a strategic rotating brush. This enables us to remove almost any type of blockage, including bird nests, from your dryer’s duct system. Our technician will also inspect your duct system for any disconnected vents. We can also evaluate if your system is operating at the manufacturer’s recommended standards. 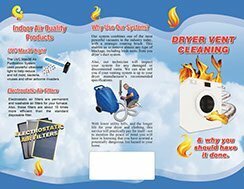 With lower utility bills, longer life for your dryer, and clothing, this service will practically pay for itself… not to mention the peace of mind you will have knowing that you have averted a potentially dangerous fire hazard in your home.